The following ten issues from the past illustrate not only our own ten years of history, but that of Czech society as a whole. Obviously, much has changed. Or has it? The story of usThis is the story of many sleepless nights spent in tiny offices in several districts of Prague before they became fashionable: Vinohrady before it became a favorite expat destination; Smíchov before Jean Nouvel put his mark on it; and finally, Holešovice with a great view of the river…right about the time the swelling waters decided to pour straight into our office building. This is the story of endless hours spent in front of second-hand computers manufactured in the Middle Ages. Its characters consisted mainly of young Czechs, French and Americans, who were (and still are) the dominant nationalities of our staff. In those early years, the members of this enthusiastic team felt they were making history – at least they surely felt they were making their own history. While some were preparing to become doctors, entrepreneurs or non-profit volunteers, when payroll time came around they could all be seen queuing behind their boss at the American Express ATM machine on Wenceslas Square. They expended a tremendous amount of energy, giving the best of themselves to a product that seemed like an act of God every time it managed to reach newsstands. This is the story, ongoing, of people that have never compromised, have always stayed true to themselves, and who have always been committed to creating each issue in the best interests of no one but the reader. 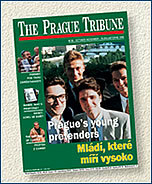 This is the story of us – all of us who have been bringing you The Prague Tribune for the last decade. 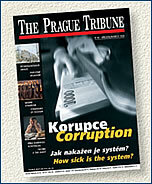 La Tribune de Prague was born in a two-color format, reflecting the general media aesthetic of the time. We didn’t sift through back benches to hear from decision-makers, instead going straight to the top for an interview with then-Prime Minister Václav Klaus. The reputed Euro-skeptic opined: “We’ll be ready to enter the EU before they’ll be ready to accept us.” Klaus was elected President on February 28th, 2003. In our third foray, which introduced color to our pages, we traded one Václav for another – this one still being revered much like a saint. But our approach to Havel was to explore not his artistic or political merits, but rather his very sizable dowry – including a fairly complete survey of the bourgeois scion’s accumulated wealth. This proved unpopular with some readers, most notably Havel’s handlers, who made clear their intention to kill a billboard campaign launched to accompany the issue. 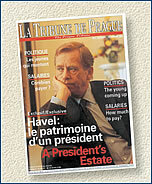 Havel’s final presidential term ended on February 2nd, 2003. 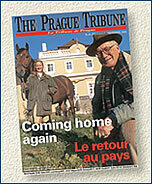 “Coming Home Again” was the theme of this issue’s cover story, which featured portraits of notable Czechs returning to the country to reap the benefits of the freed market after periods spent abroad. Included in the piece was Gabriel Eichler, then a new board member at power producer ČEZ. 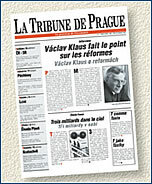 Issue #9 also included a radical reshaping of the magazine: “La Tribune” underwent a strategy shift, from targeting readers in French-speaking countries to targeting the international community here, thus becoming “The Prague Tribune”! Once the bogeymen of communism, the security organization known as the StB managed to make it through the ’89 revolution in pretty good shape: many former spooks landed lucrative jobs in the brave new world of capitalism. Six years after the revolution we took an in-depth look at those who’d gone from peeping in windows to purchasing privatized property. Our favorite quote from former StB man turned Chemapol Group general director, Václav Junek: “experience from the past regime is definitely useful now.” Three years later, due to a series of questionable loans, massive debts amounting to CZK 30 billion sent Chemapol into a catastrophic bankruptcy. By ’96 a new breed of managers had appeared on the scene. Our piece on young up-and-comers featured a baby-faced Petra Buzková (then a 30-year-old vice-chair of ČSSD), and Michal Hlášek, at the time a 27-year-old vice-president of Citibank. Said Hlášek of his precocious start in the financial world: “I didn’t know anything about financial or securities laws, but I was lucky because the rest of the country didn’t know either.” Mrs. Buzková is the current Minister of Education, while Mr. Hlášek went on to change fields and study law in England. In this issue we took aim at native dislike of our neighbors to the northwest in a light-hearted manner. The result: a competition to come up with ad campaigns designed to encourage Czechs to start embracing Germans. Leo Burnett handed in winning images of beastly, rotund Deutscher Volk giving a big “Danke” to Czechs for such gifts as Becherovka and spa wafers. 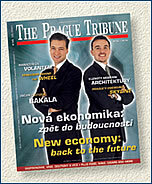 Though it’s unclear whether general sentiments have changed, more Czechs now work for German-owned firms than ever before: according to the Czech National Bank, German investment into this economy has increased from CZK 12 billion in’97 (when this story ran), to over CZK 150 trillion in 2002. By ’98 it was apparent mobile phones would soon be making a lot of people very wealthy. The two operators in existence at the time, Eurotel and RadioMobil, were certainly not eager to share pieces of the growing pie. Our cover featured CEOs Mac Allman and Klaus Tebbe facing off with medieval weaponry. While the two men were photographed separately, the weapons were real (sort of): we borrowed them from a Prague tourist trap known as the Museum of Torture. 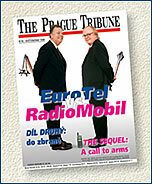 When the article appeared, market leader Eurotel had just over 300,000 customers. It now has more than 3 million. Admittedly, we could write a story on corruption a few times a year. But in early ’99 we took an even-handed look at just how general was the rot. When asked to predict when a major improvement might occur, Jaroslav Bašta, then head of the ČSSD’s “Clean Hands” campaign (which didn’t manage to secure a single indictment) said, “it’s a bit like asking when someone who has cancer will be okay again.” Bašta, it should be noted, resigned from “Clean Hands” in mid-term. His reward for the splendidly ineffective job he’d done? An appointment as ambassador to Russia. 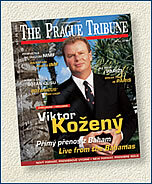 Viktor Kožený, the “Pirate of Prague”, graced this cover; he’d agreed to an exclusive interview by telephone from his home in the Bahamas. When asked how he’d like to be remembered, Kožený retorted, “well, I don’t think I’m gone yet.” Kožený, as head of now-bankrupt Harvard Funds, was already renowned for having bilked investors out of huge sums. His legal troubles in this country are not over, as he’s still wanted on charges of fraud amounting some CZK 11.5 billion. However the Bahamas and the Czech Republic have no legal treaties enabling extradition. 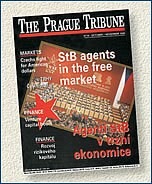 This issue also heralded a major redesign: The Prague Tribune became smaller, slicker, and a lot easier on the eyes. Post-euphoria we took a look at how the formerly “new” economy, fast becoming the “bad joke” economy, was playing out in the Czech market. Featured on the cover was the director of the firm Private Investors, Dušan Tejkal, who gushed about the wonderful way his clients could stay on top of their investments on the Nasdaq market (which punters thought would yet revive) via the internet. Unfortunately, no one was staying on top of Tejkal. Four months after the story ran, his firm collapsed and he was charged with embezzling funds estimated to have cost investors nearly CZK 1 billion. One of the most dominant personalities in the Czech business world, Vladimír Železný, had decided to throw his hat into the political arena, so we decided it was time for an in-depth profile. The piece pulled together the many aspects of the man: intellectual, media mogul and politician, for a comprehensive examination. Železný is not receptive to requests for interviews from media not in his control, and so declined to comment in much detail for our story. Those unafraid of speaking out, however, were senators not terribly excited to be welcoming to the fold a man with so many well-publicized legal troubles. 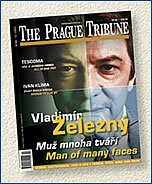 One month after the article ran, on January 7th, 2003, Senator Železný’s senatorial immunity was stripped.